Sean Dyche was in the news. Stuart Pearce on Talksport said that he is the manager that new young managers should been looking up to, never mind your Mourhinos. Alex Ferguson, according to Alastair Campbell in a Nick Robinson interview, said along with Alan Pardew, Dyche is currently one of the two best managers around. The weather wintry, cold winds from the north, in fact snow had been forecast, the game on TV and a 1.15 kick off. There had been the 2-week international break and Tom Heaton still hadn’t got a few minutes on the pitch with England; bit mean of Roy we all thought. 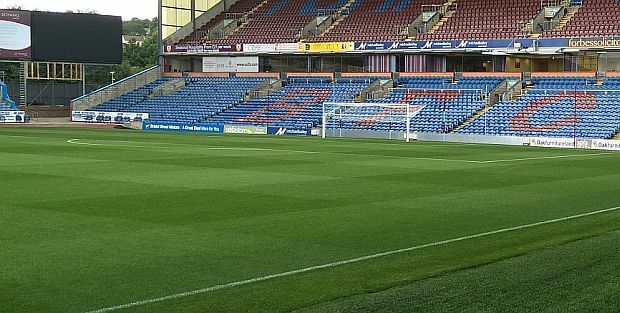 The Desso Turf Moor pitch looked splendid and there’s a shedload of equipment and lighting rigs to keep it in tip top shape. I found a piece from the 80s about Roy Oldfield and his work on the pitch and he had that infamous strip down the Bob Lord side that never seemed to drain properly to contend with. He had one moody old mower that was more temperamental than Grace Jones. We had a similar but smaller petrol mower years ago chez moi and life revolved around whether it would start or not at weekends. ‘Clarets fans may criticise the team from time to time, they may criticise the manager and directors but few could complain about the turf at Turf Moor. The pitch which measures almost two acres has been the responsibility of groundsman Roy Oldfield for 17 seasons, save a spell away from the club of about four years. ‘Roy’s job is as unpredictable as the weather and he avidly watches the forecasts on TV to try to be one step ahead of his greatest opponent. ‘The weather is my enemy not the players,’ he said. ‘The Monday morning after a game on a Saturday sees Liverpool-born Roy, 55, on the pitch with his assistants Aden McGough and Lee Hall. Their first job is to try to patch up the turf after it has been cut up by the players on Saturday afternoons and that can take up to six hours if it is in a really bad way. Tuesday’s main job is to roll the pitch and in the summer trim the grass if necessary to ensure that the surface is as flat as possible. ‘The pitch is then spiked to a depth of about six inches to encourage drainage and allow air to get to the roots. On Friday the grass gets a trim although Roy does not believe in giving it a proper scalping. “I do not cut it very short because it helps keep the grass and you need it in the winter months,” he said. ‘Roy is at Turf Moor at 8-45 a.m. on Saturday to carry out a few pre-match duties such as checking the pitch once more and the nets. The next task for Roy and the rest of the ground staff is to mark out the pitch and this is done as late as possible on match day. He then checks the players’ changing rooms and cleans out the dug-outs, furnishing them with cushions and substitute cards. ‘The referee usually arrives around lunchtime and Roy is there to welcome him with a cup of tea and a warm welcome. Then he is ready for the kick-off. ‘When it’s all over Roy checks the changing rooms to make sure the lights are off and the taps turned off and if there is a forecast of frost he will stay until about 7.30 to roll the pitch. Sunday is usually a day of rest unless there is a mid-week match at Turf Moor and the whole process starts again. It all sounds relatively straightforward until you take the weather into consideration. ‘Roy has nightmares about waking up on a Saturday to find there has been a heavy downpour. A deluge just before a game can be a killer. “You have got a very hard job to get all the water away. You have to fork it and spike it and while the teams are travelling and the supporters are on their way you are doing your best to get the water off the surface,” he said. ‘Snow is the other blight although the groundstaff can roll that out and mark the lines in either blue or red. Basically Roy and his team will do anything to make sure the game goes ahead. ‘He is now working under his twelfth manager at Turf Moor and was first employed when Jimmy Adamson held the post replacing John Jameson who taught him the ins and outs of the job. During his time there he has met some of the greatest names in the game including Denis Law, Kevin Keegan and Kenny Dalglish. But his meeting with one man stands out in his memory. There were indeed snitterings of snow across East Lancashire the day before the game; in Leeds it was a day for sitting in front of the fire watching Sky Soccer Saturday, results not all that helpful to Burnley with Middlesbrough winning on Friday night with an extra –time penalty. Other results conspired to put Burnley down to fifth. 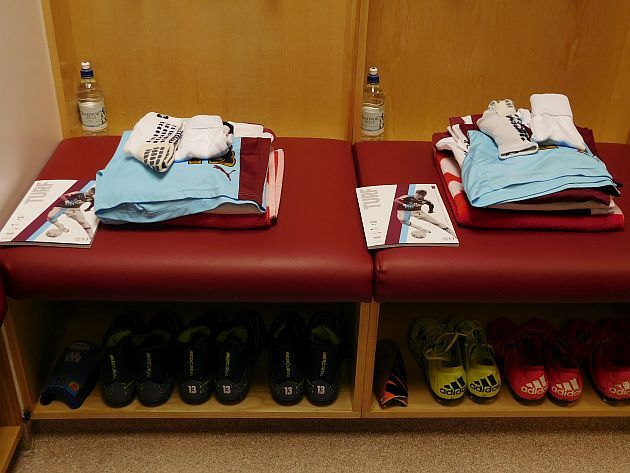 Two Burnley players were just pleased and relieved to be home. Both had been in France at the time of the terrorist attacks in Paris. George Boyd had been at Euro Disney with his family. Chris Long had actually been in the Stade de France and was in an evacuated hotel. Before the Brighton game there was an immaculate minute’s silence in memory of the slain and to show solidarity with those affected. These are troubled times that we live in. The events at the French national stadium served to show that football is no longer a 90-minute escape from reality and Andrew Neil’s searing TV tirade sums up how probably most of us feel. This is maybe not the place to reproduce it but just google Andrew Neil TV rant. Over 15,000 saw a real mish mash of a game. Something around 350 came up from Brighton and fair play to them; they don’t like coming up to the frozen north where they think streets are still cobbled, we all eat Lancashire Hot Pot every day and have lofts full of pigeons. And a curious game it was with a blistering opening five minutes that suggested that by the end of it we might be going home having seen a ten-goal classic. Normality then set in and thoughts of a 5-5 draw became fanciful if not downright silly, when it became clear that this was developing into a game where the two teams were about to cancel each other out and flair was very much absent. Brighton were a goal up within a minute thanks to Zamora and a bit of pinball but Burnley were level just three minutes later when the referee spotted serious shirt pulling and Gray smacked home the penalty. And then, sadly, for the next 40 minutes it became cat and mouse stuff, fine if you like that sort of thing, but dullish if you fancy something more entertaining served up by flying wingers and rumbustious centre-forwards with foreheads like dustbin lids. Vokes was unavailable, the Jut and Barnes far from fitness and any chance of a return, so all Gray had to accompany him was Hennings or Long. Arfield and Boyd are what they are and good at it, runners and workers, industrious and dedicated to the cause; but consistent pace to the by-line and a constant supply of deadly crosses are just not their forte. From this whirlwind beginning the game until half-time became what we had always imagined it would be, dogged, pedantic, predictable, and almost tedious for the last half hour of the first half. When Willie Irvine came on at halftime to receive his plaque to commemorate his 29-goal record, those of us with more years than we care to remember behind us, thought of his partnership with Andy Lochhead, both of them feeding off pinpoint crosses from Willie Morgan or Ralph Coates. Then we gave ourselves a reality check and remembered that this is no longer ‘then’, it is today and now we see players earning money that Irvine and Lochhead would never have thought possible. Brighton had been well organised, well-drilled, systematic, frequently spoiling and mauling; lucky not to have had more players booked for all the grappling and jostling they got away with, especially when faced with Gray. They moved up the field purposefully and methodically, always had a man wide, but in truth created little in the penalty area or seriously tested Heaton. Yes they looked a very competent side and it was easy to see why they remained unbeaten. But other than the one goal they scored it was hard to think of another good chance they created for all their possession. It was a pattern that continued in the second half but Burnley must have had an earwigging or a straightener. In the new half they were much more threatening, Boyd having his best game for a while and Gray a constant handful. But sadly there was no big man alongside, no-one to share the load, take some of the bruises, or win the ball in the air. Corners were largely comfortably headed clear or caught by the goalkeeper. Brighton hardly looked like scoring again but Burnley most certainly did. Already in the first half they’d forced a wonder or a fluke point-blank save from the goalkeeper, it was hard to decide which. In the second Arfield smote a mighty shot from distance to cap a good move; it would have made his Blackburn goal look average, had it gone in. It missed by a fraction. Keane was only a toe-poke away from connecting with a Mee flick-on header, Long just a yard out latched onto a ball that had bounced off another player but put it wide. But the moment when you knew that this would surely end as a 1-1 draw came when the ball came out to an unmarked Arfield in the corner of the area. Running in he met the ball maybe 12 yards out, the goal gaping, the crowd convinced the winner was coming, all of us ready to stand and bellow and shout, he surely couldn’t miss. This is what they practise all week, he’d scored a belter at Blackburn and this was an even easier chance. But miss he did and powered the ball wide of the post, not even on target. Other than Long coming on for Hennings other subs remained unused. We wondered if Taylor or Kightly would be brought on to shake things up a bit and replace tiring legs; the answer was no. The game concluded as we ought to have known it would, as an inevitable draw. There was no goal avalanche but enough near misses or attempts by Burnley in the second half to convince us that had Burnley nicked it, it would have been deserved. ‘Not enough pace or width to break down the better teams,’ mailed Berian from Oz who had seen the game on TV. ‘Maybe on another day Arfield’s late shot would have sneaked inside the post,’ Gunnar mailed from Alesund. ‘But you can’t always get what you want, sang Mick Jagger years ago,’ he added. We began to shuffle out at the end but then something quite unnerving happened. Overhead we heard the drone of a low flying single-engined plane. From the upper James Hargreaves it was out of sight and we craned our necks to look upwards. The sounded faded but then returned as if it was doing a second pass over the ground behind us. Were Mrs T and me the only ones that felt slightly unnerved? By this time most heads and eyes near us were turned upwards and you could almost sense the same thoughts in people’s minds. ‘What the hell is that and what is it doing over a football ground?’ Eventually it left the area and the sound of the engine faded away completely but it served to show that the events and vivid imagery of the Friday terrorism in Paris have got to most, if not all of us. For a few moments there was a real feeling of suspicion and apprehension in people around us. Suet Rag Pudding at the Shepherd’s Rest at Lumbutts above Todmorden, followed by Ginger Sponge pudding and custard restored a sense of calm and well-being. A bottle of Sauvignon Blanc most certainly played its part. A French cartoon was defiant. ‘You’ve got the bullets but we’ve got the champagne,’ was the caption. Amen to that. There’s a defeat due at Wolves said Ian Holloway for Burnley, a good side but just due a defeat. It was a return home for Andre Gray brought up within minutes of Molineux and on their books until he was 13. It was a return for four Clarets, Jones, Ward, Kightly and Vokes who all featured in the 2009 Wolves side. For Tom Heaton it was his 100th consecutive league game. And on the Wolves side was the reformed Kevin MacDonald brought to Turf Moor by Owen Coyle and forever remembered for his half-time disappearing act in the game against Man City in the downpour. Today he says he is a more mature person and that his trip to the pub was blown out of all proportion and it was ludicrous anyway to say he had been to the pub. Wolves hadn’t been too clever of late but over the years their record against Burnley on their home patch has been good with 7 wins out of the last 10 meeings. At the beginning of the season Mrs T put it on the list of games that we would go to. We didn’t; new windows and paying for them became the priority. But here’s a test of honesty. They fitted them a month ago and still haven’t sent the bill. What do I do? I scanned the reports and the messageboards. By all accounts not a lot happened in the game once the Remembrance Day silence had been observed. In the first half Burnley had some shots; in the second half Wolves had some shots. Nobody scored and everyone went home many thinking what a waste of an afternoon. Sometimes there seems not a lot more you can write except that after the game suddenly to everyone’s surprise, the lawnmowers started up. Much was made of the flat, dead turf with the grass being long enough to warrant cutting after the game. Dyche himself made a point of mentioning it. Did the Wolves manager want long grass to stifle Burnley’s game? It turned out that he did saying later he wanted to affect the speed at which Burnley broke and by that presumably meaning the balls played through to Andre Gray. Was this underhand gamesmanship or super-professionalism and attention to detail? There is the story that at Burnley years ago manager Brian Miller had the pitch deliberately flooded overnight by leaving the sprinklers on so that the game the next day would be postponed. A local referee was summoned early in the morning who cancelled the game. He cottoned on immediately to what had happened and said er don’t be asking me to do this again will you? By coincidence in the week I’d been to visit Roy Oldfield who had been groundsman at Turf Moor for a long period between 1972 and what Roy thought was something around 1992. Roy is in his 80s now with lots of memories and what I hope in the coming weeks will be a few tales to tell. It’s a fascinating period in Burnley history including relegations and promotions, the Celtic Game, the Orient game, managers like Adamson, Potts, Miller, and John Bond, Chairman Bob Lord and then John Jackson, and all of the Wilderness Years. 1972 and Roy remembered it like it was yesterday when Burnley manager Jimmy Adamson walking in Scott’s Park asked him would he be able to come up to the house to talk about doing some work. Roy was a gardener at Scott’s Park much preferring the outdoor life to the pit where he had once worked long, back-breaking hours. Gardening could be long and arduous too, but in glorious weather under sun and blue skies there was no comparison with the stooped, dusty, choking and claustrophobic life underground, if a life is what it was. Down the mines he dug coal in the semi-dark; at Scott Park he dug flower beds in the fresh outdoor air, looked after the rose and shrub beds, and tended the herbaceous borders and the lawns. It was the best swap he ever made he says and the good job he did there was quietly noticed by the Burnley manager. Scott Park was one of Burnley’s four flagship parks; it was the second biggest and had been gifted to the town by businessman Alderman John Hargreaves Scott who willed a sufficient amount of money to develop a park for the benefit of the Burnley people. When Burnley Corporation acquired the Hood House Estate it was decided that this would be the place where a park could be created that complied with Scott’s wishes. It opened in 1893 but the official opening was two years later when it was dedicated to the people of Burnley. And how they needed these green spaces as somewhere to find escape from the grimy back-to-back terraced houses in which they lived and the drab streets and the endless, low-paid toil in the factories and mines. 1972 was a transitional year at the football club. At the end of season ‘71/72 the club had finished in seventh place following relegation the season before. Season ‘72/73 would see a return to the top flight. Adamson had certainly felt fierce antagonism but Lord had stuck by him. As he walked his Scottish Terrier round the park the gardeners were never short of a quip or two, usually good-natured, recalls Roy and he would often stop and chat about the team and the results as the season progressed. The end of season ‘71/72 had seen a run of several consecutive wins. The banter became more good natured. So, assuming it would be something and nothing in Jimmy’s garden, at 5 that day Roy downed his tools, cleaned up and set off for Jimmy’s house. ‘But I know nowt about being a groundsman,’ he answered almost lost for words and completely taken aback, whereupon Adamson assured him that he’d learn all there was to know from the guy soon to retire, John Jameson. The next step was to meet Chairman Bob Lord for his approval and to sort out a wage. Roy remembers thinking that he’d be a bit crafty and take old wage slips to show him that included overtime so that Lord would see that he was on a good wage that he would at least have to match. They talked about things for a while and Lords gave only a cursory glance at the wage slips. Lord then sat back in his resplendent pomp and nodded. Roy stopped in his tracks. ‘But we’ll see thee right,’ Lord added with a faint grin. It was agreed that Roy would begin as assistant groundsman learning the job from John Jameson. Well over 40 years later he still laughs at Lord’s words that he repeated again: ‘and by the way, them wage slips includes overtime on ‘em – but we’ll see thee right.’ Roy thought it was funny then, and still does. Bob Lord did see him right and Roy Oldfield has nothing but good memories of him – except for the mug of tea he made for him the first time he ever went to Lord’s house to do some work. The tale that Bob Lord sacked Roy for not watering his tomatoes rang no bells with him. It was Jimmy Adamson who told this story in an unpublished magazine article that years later appeared in the Adamson book, The Man Who said No to England. ‘Maybe it was a lad called Ian Rawson that was sacked and that was in trouble for the tomatoes. I do know that Bob lord did eventually sack him when he caught him at Turf Moor cutting the grass and the lines weren’t straight and Ian had been larking about doing them in a zig zag pattern if I remember rightly. Bob had been watching him for a while and if you didn’t work and do your job right then that was it, you were sacked. It was all smiles at the board meeting the day before the Huddersfield game. And why shouldn’t it have been. Money in the bank, Danny Ings money still to come, the points piling up, the win at Blackburn, the new office block nearing completion, the green light for Gawthorpe, and Sean D’s big surprise. Ya Ya Toure didn’t get one for his birthday and had a strop but here at Burnley we know how to be generous with people. If they do good, they get a cake. It took Sean D by surprise, because he wondered if he might get a Rolex. He accepted the cake with good grace then wondered if there might be a Rolex inside. No, he said, just sultanas. Good job he didn’t know that 100 years ago player Billy Watson was given a gold watch to mark his 100th game. Sean, this is Burnley not Barcelona. In the poorer days of the Wilderness Years it might just have been an Oddies sausage roll. Even special guests when they are hosted in the boardroom only get fish and chips. The board in fact lashed out on the cake. It was from M&S and then Barrie Oliver decorated it DIY style. The Turf Moor Thrift Stadium has a nice ring to it. The inquests on the win over Huddersfield win were plentiful. The mantra seems to be: ‘one day a team will come to Turf Moor and get a hammering.’ The feeling was that it is Huddersfield that should have been that team, but chances were missed, the post was hit, the foot came off the pedal, the coasting began, Huddersfield stepped up their game and we all know what happened next. It was all so close to going the way of other games when there have been 2-0 leads. We knew it was Halloween but these are scares we can do without. The Monday papers in Yorkshire paid tribute to Burnley’s organisation and being a difficult team to beat. It’s an apt summary and once again Andre Gray was cited as being the difference between Burnley and their opponents. With the win and another three points the question ‘is Sean Dyche Burnley’s greatest ever manager’ might have won a few more yes votes. When last I looked over 60% said yes as opposed to ‘needs more time.’ With that in mind I looked up a name that is huge in Burnley history but because it’s a name way back from 1910 to 1924 it is seldom mentioned. It’s in the history books alright but I’d guess if you sat a dozen people round a table in the pub for a good discussion he’d get few votes simply because he is so long before people’s memories and from a bygone era, but he’d certainly be my nomination. He was the man who changed the colour of the shirts from green to claret so that every time you bellow ‘come on you clarets’ you honour John Haworth. He signed Bert Freeman, Tommy Boyle and Bob Kelly, three galacticos of the era. He won promotion to Division One in 1913. He won the FA Cup in 1914. On resumption of ‘normal’ football in 1919 he took BFC to runners-up spot in Division One. The next season they won the title and set a record of 30 unbeaten games. In 1921/22 they were third in the table. Sadly he died at the early age of just 48 in 1924. All this was in an age without mobiles, fax, texts, emails, computers, laptops, iPads and motorways. They went around by train and John Haworth was secretary, odd-job man, chief bottle-washer and jack of all trades. A trainer did the muddy work. He had a telephone that didn’t always work plus a desk and the Post Office. It was in a Burnley of poverty, slum conditions, bad health, poor diet, low wages and exploitation, the oppression of working classes and a background of us and them. The ruling classes looked down their noses at football and it was beneath middle-class sensibilities because they thought it encouraged poor behaviour. Whilst he was at Burnley producing successful and winning teams Haworth gave the town pride; on Saturday afternoons he gave release and escape to crowds of working men who could take their minds off all their daily troubles. He brought a little bit of colour to an otherwise grey drab town. Jimmy Mac tells a story about the great Bob Kelly. Sometimes Jimmy would take a stroll round Scott Park and there he would meet an old chap that he used to stop and chat with. His name oddly enough was Bob Lord although it certainly wasn’t THE Bob Lord. Of course they used to chat about football and the old lad was by then in his 80s and could well remember seeing the great Bob Kelly play and used to explain to Jimmy just how good he was. And then he would pause, look nostalgic, and always ended by saying: ‘Thee were a great player Jimmy but then so were yon Kelly. I reckon ‘e were just a bit better than you ‘n all by about this much,’ whereupon old Bob would use a finger on each hand and hold them up about two inches apart. Fulham matchday: over the years at Turf Moor Burnley have rarely lost against Fulham. But this time Fulham arrived with their strikers on fire. The night damp, misty and grey, the kind of night when we tell ourselves that these southern teams come out shivering and wishing they were somewhere else. We were in the 1882 and the Bob Lord for a change and it was hard to remember a time when we’d sat there and seen a win. There was one in Stan’s time I think and before that it was 1968 and the FA Youth Cup win. But to compensate for that we were on table 13 and 13 has never been an unlucky number for me oddly enough. It was McCormack that was more worrying and Jamie O Hara in midfield for Fulham than some ancient superstition. A misty fug was slowly settling around the ground but inside the 1882 it was warm as toast and the Baked Salted Caramel Cheesecake was outstanding. ‘Tell chef this cheesecake is to die for,’ I said to catering-maestro Chris Gibson. ‘Never mind, tell him he slices it beautifully,’ I said the last piece slithering down nicely and Mrs T knocking back the Pinot Grigiot. Burnley spent the first ten minutes finding their way and Fulham slipped the ball to each other neatly. The view was different for us, this time low down, near the front, up close and personal, seeing players in bone-jarring tackles, sweat pouring off them, making massive efforts and showing huge determination. The runs at speed are breathtaking, the athleticism is clear to see. And all the while we are behind Sean Dyche, the man in black, sipping water, urging, cajoling, pacing, consulting staff, exhorting and encouraging. You can see how Andre Gray is as strong as a bull, shielding the ball, sticking his backside out so that the defender has no chance of winning the ball and then he’s away before you can blink. It was what Jimmy Mac used to do years ago. Despite two rushed shots, Sam Vokes had his best game for an age, his close control, cross-field runs, the spins and turns a treat to watch. Jones was simply majestic pulling the strings, never wasting a ball, the unsung hero and my MOTM despite Gray’s two goals. Barton has given him a new lease of life. And Barton, here there and everywhere, the cheeky chappie, mopping up, making passes, keeping it moving and of course chatting to the referee. With that first tentative 10 minutes out of the way Burnley took over and ran rings round Fulham. This was a display of power football, of movement, of pace and incessant pressure. It paid off to the tune of two goals, the first a Gray header from a deep cross. How Gray rose that high to meet it is testament to his power, surrounded by six-foot giants. His second was a blistering shot low along the ground from 18 yards latching onto a superb through ball. The 1882 buzzed at half time as we warmed up and thawed out. 2-0 at half-time was a dream of a scoreline and the quality of football was exceptional. When we play like that, there’s not a team in this league can live with us, said the guy sat next to me. In the second half the cross bar cruelly denied Gray of a hat trick when he chipped and pinged. A Vokes header was heading like an arrow to the top corner until from nowhere a defender cleared from just under the crossbar. Another Gray shot whistled just over the cross bar. But groans and furrowed brows appeared before that. McCormack scored early on. Somehow the ball was worked into the Burnley box and there he was to slam it home. Fulham spirits were lifted, now it was them in the ascendancy but even so the best chances fell to Burnley. It became end to end, nip and tuck as the minutes ticked by and we willed that clock to hurry home with Heaton now earning his bonus. Boyd was replaced by Matt Taylor, Gray by Long. The Fulham aerial onslaught was contained by Duff and Keane. Everybody dug in and slowly bit by bit the Fulham efforts diminished. By now Arfield was getting back into the game more and more and it was from him that Burnley’s third was contrived. It started with a contested throw-in on the right with Fulham defenders incensed they hadn’t won the throw and still haranguing the linesman after the final whistle. The ball came over to the left, Arfield pinged it in and the next thing we knew was that the ball was nestling in the Fulham net and Matt Taylor was racing away into the corner arms raised jubilantly. Arfield had slipped the ball across and there he had been to sidefoot it home. After the game: the 1882. Barry Kilby brings Andre Gray for his MOTM presentation and the memory this leaves is the unfailing smiling patience of the guy as he stays behind for as long as people want to come up, shake his hand, have programmes signed, take photographs and give him a hug. He was so close to a brilliant hat-trick. The arguments begin as to which of them is the better striker, Gray or Ings: Phil Bird likens him to an early Ian Wright. Only months ago he was in the Conference. The media still likes to label him the £9million striker but whether it was £6million or £9million it was money well spent. From our normal perch in the upper James Hargreaves we just don’t see how strong these guys are and the punishment they take. Something else we noticed from these unaccustomed seats was just how Matt Taylor plays with a smile on his face. More than once he looked across to Dyche with a quip and a laugh. Nice teeth we noticed too, the other day. A survey by the University College London undertook a study of footballers’ teeth from eight clubs and discovered that on the whole footballers’ teeth are in a poorer state than those of the general population, including infections and gum disease and this could be affecting their performances on the pitch. Let’s face it; do any of us concentrate on work if we have a raging toothache? One in five footballers has suffered teeth injuries during a game. 37% of footballers had at least one tooth affected by decay. 75% of footballers needed fillings. More than 25% were sensitive to hot or cold drinks. Not a lot of people know that. A great night then, boy that cheesecake was good, and a worthy win. It’s the best we’ve played this season said Sean D. Someone came up with the headline or strapline, Fulham beaten by two shades of Gray and a Matt finish. Whoever thought of that deserves a bonus. We thought that the win at Ewood 2 years ago was special and then along comes another to store away in our heads for rainy days. Of course the win in the promotion season maybe carries the bigger significance seeing as it was the first for 35 years and the Clarets had been 1-0 down. But this one was up there too in the list of top games to remember. Scattered amongst the Burnley end were more than just a few fans dressed in chicken outfits or wearing chicken masks. For those who were there, the bus ride home must have been a jubilant 7-mile celebration party. A pretty game this was not. Ugly it might have been. Burnley were far from fluent; they were as they have been all season grinding out a result with resilience and resolve, defenders digging deep, tackling, covering, blocking, clearing, filling the box with bodies, Heaton in top, top form and Barton producing a man of the match performance. It may not have been the best example of ‘the beautiful game’ yet it was filled with heart stopping moments and packed with dramatic incidents. Each side could have had a penalty when in the first instance Hanley’s legs tangled with Barton’s and sent him crashing down. At the other end Barton did exactly the same thing bringing a Blackburn player down. The referee said no to both of them. Maybe they were marginal and each cancelled out the other. But the blatant pen that went unpunished was when Hanley deliberately tripped Barton immediately after they both got up. Both were still in the penalty area with the ball in play way upfield. Neither ref nor linesman saw it. The cameras did. For Hanley it would have been a red card but both linesman and referee would not have been looking that way. Hanley knew what he was cynically doing but in the end it mattered not one jot. The Joey of ten years ago might well have got up and lamped Hanley; the new Joey just looked mildly miffed, got up and got on with the game. The goal of course was sublime. From a free kick Mee eventually swiped at the ball and hit thin air, but was smart enough seconds later to compose himself and roll it back just a few yards to Arfield lurking on the edge of the box who side footed it beautifully into the top corner. If that wasn’t memorable enough his charge to the opposite end of the ground with the rest of the team in hot pursuit was a celebration to remember. He collected Duff on the way and arm in arm they ran right to the Burnley fans that by this time were totally beside themselves with the sheer joy and wonder of the whole thing. A second win at Ewood was just too much to contemplate with much of the half remaining. In the dying seconds Heaton produced a wonder save from a Duffy header that was heading in. When Brian Clough bought Peter Shilton he announced that Shilton would win them at least 12 points that season. Heaton may well do the same at Burnley. Duffy looked crestfallen. Jordan must have felt much the same by the end of the game. He had three good attempts but it just wasn’t his day. It just wasn’t Blackburn’s day at all. They hit the woodwork with a screamer and missed another golden chance when it would have been easier to score. They dominated the first 20 minutes when Burnley could do little right. But there was no way past Heaton and the defence. If relentless was once the key word, now it was resilient. If it was once remorseless, now it was resistant. Amazingly there was not one yellow card with nothing at all to resemble the games that Steve Kindon remembers vividly, other than a bit of handbags stuff between Gray and Marshall. Kindon remembers real animosity on these derby days and the time he had his nose broken. That was on Boxing Day 1977 and a 3-2 defeat at Burnley. It was a time when Burnley under Harry Potts were not doing at all well; the game was all physical and a real battle. Into the second half and Kindon was in hot pursuit of a long ball in front of the Bob Lord. An elbow clattered into his face leaving blood everywhere, all over his shirt and his nose broken in two. To say he was angry and sought retribution is an understatement and receiving treatment in the dressing room all he wanted to do was get back on and seek out the culprit. As he came back on, the Blackburn players knew how psyched up Kindon was and Derek Fazakerly told him to go back off before he did anything stupid. He did his best to seek revenge, Brian Miller had told him who it was, but the Blackburn player kept well away, well shielded by his team-mates. Sean Dyche’s profile was raised even further. He did not end up at Sunderland but with Tim Sherwood gone at Villa after another defeat, and Sherwood looking more and more morose, now it was the Villa job under the spotlight. The pundits were writing: when oh when will a leading Premier club give a chance to Sean Dyche, presuming that’s what he wants one day. Dyche recently acknowledged the influence on him of two other managers – Brian Clough and Alex Ferguson. Ferguson in his newest book Leaders praises Dyche highly and sees him as one of the most promising managers in the game. Dyche spoke in depth to reporter Chris Boden, the gist of it being you can’t treat everyone the same, different types need different handling, you have to know the group and the individuals and what works best for them, there’s no one perfect way; he’s managed around 200 games and uses different styles all the time. So far it’s working and it was good waking up on Sunday morning after the Blackburn game to think we’d got one over them yet again, Burnley certainly the dominant club at the moment, the days of Rovers buying a title long gone and 10,000 empty seats in the Rovers stands. Now it’s Burnley fans hiring planes with messages aimed at Blackburn that say: In Venkys We Trust. I sang a quick verse of’ Oh what a beautiful morning, oh what a beautiful day,’ in the bath. A very hot bath first thing every morning is now a must these days to get my back loosened up. Paul Fletcher did the same before a game as he got older. ‘I was never fast but I was always clean,’ he says today. It was hard to decide who you wanted to lose in the Leeds v Blackburn game but it was obvious within minutes which way it would go. Maximo Cellino chose the pre-match music Things Can Only Get Better. Whoops, they didn’t. Give them credit, Blackburn were decent and forgive me Lord but I’d take Lawrence and Conway at Turf Moor. Cellino’s glowering face, Leeds fans’ faces grim, glum and almost bewildered, the thousands of empty seats and the abject poverty of Leeds’ attempts to salvage something are the images that remain. There are allegedly, according to an insider, over 30 legal claims against the club for unpaid debts whilst dozens of staff and contracted professionals have been shown the door, many almost on a whim, according to the Independent, describing Elland Road as a God-forsaken place from top to bottom and currently paying off 4 previous managers. Cameron Stewart, one of the most underwhelming players briefly to light the Turf Moor stage, reportedly received £750k in a claim for wrongful dismissal. Who says being average doesn’t pay? Evans gone by Christmas – he will probably say it was an honour and a privilege to have been sacked by Cellino; a bit like the journalists that were all banned from Turf Moor by Old Bob who considered it a badge of honour and wore special ties to mark their membership of this exclusive club. Evans says he needs six new players. He’ll have to hurry; his time is running out; Leeds have had more managers than home wins so far in 2015. Him: Hi how are you. Me: Fine I enjoyed my 2 weeks in Kalkan very much. Him: That is good how about I can clean your pool. Me: I do not have a house in Kalkan with a pool but I do have a large bath in my house in England. Him: OK I have plot of land for sale. Me: Sorry I am but a poor Englishman with no money. I haven’t heard from him since. Saturday against Huddersfield: a special day for grandson Joe. His Aunty Victoria had decided to sponsor Matt Taylor and it was the day to meet him and receive two signed shirts, a home and away. Matt Taylor is currently Joe’s number one now that Trippier and Ings have gone. He must have watched the video of Taylor’s goal at Nottingham 20 times and has action-replayed it down our hall 100 times with the door at the end receiving some serious grief. He spent most of the school holiday week with us eating us out of house and home. By the time of the game Sean D had been presented with a 3-year anniversary cake in the boardroom and Barry K had agreed to take on the role of Vice Chairman now that his health issues were under control. It was a weekend of celebration then with the question being asked: Is Sean Dyche the greatest ever Burnley manager? Win promotion again this season and the answer would be a resounding yes for this charismatic, larger-than-life man, but in the meantime the other nominations in the sealed envelope (the criteria being achievements and contributions to the club) are John Haworth, Cliff Britton, Alan Brown, Harry Potts, Jimmy Adamson, Jimmy Mullen and Stan Ternent. Owen Coyle was disqualified. One thing is for certain: this club has never had such a good group of people in charge, from the manager, to the CEO and the Boardroom. Breakfast: Leeds and the Elland Road comedy club shrouded in mist and gloom, Cellino agreeing in principle to sell to a Supporters Group. I sprinkled salt on my boiled egg (6 minutes from boiling) lightly. Leeds supporters sprinkled it heavily on the use of Cellino and principle in the same sentence. The ground by the way is owned by a guy from Manchester just to add to the mix. Now there is talk of renaming it Poundland Road. We were there very early to be taken round the pitch perimeter to meet Matt Taylor and receive a couple of shirts. Even before 1.00 in the ground there was a buzz; the buzz based very much on the fact that at this point in time things were going so well, optimism high, staff filled with cheerfulness and good spirits, the place filled with smiles. You can’t buy this sort of stuff; you can’t just ship it in. When I was a Head I was blessed with a staff that in the main were just miserable farts. Pitchside at just after 1.00, the ground and turf immaculate, the weather mild and dry, and it’s surprising just how many different groups are wandering round, how many players are meeting and greeting. 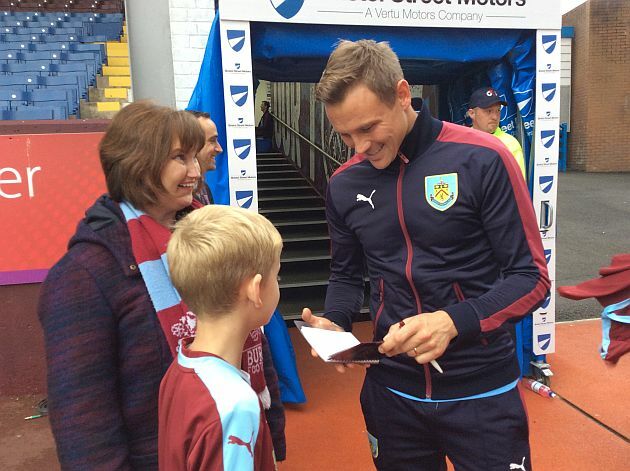 At the entrance to the players’ tunnel it was like Charter Walk on payday, Joe and Aunty Victoria looking star struck, Mrs T chatting away, Michael Duff with a group, Dave Jones and Tom Heaton stretching their legs, Ashley Barnes wandering round to the Fanzone, photographs galore. But where was Bertie Bee? No sign of him anywhere, not there or later during the game. Had his new book success gone to his head? Had book launch day and signing lots of books and crowds queueing to see him persuaded him he was now a Bee list celebrity? There were rumours he’d flown off to Hollywood convinced he was now worth bigger and better things hoping to get a star role in a remake of The Sting. And the game: It was a Halloween Trick or Treat Special. They must have trained specially for this tricking us into thinking it was all done and dusted, 2-0 up and coasting thanks to a Gray penalty and a Gray net buster, spraying the ball around, snuffing out any threats, Heaton making saves when he needed to, creating plenty of chances and all of it tricking us into a sense of security that the win was but minutes away with nothing to worry about. And trick us they did for then there was a final short period when we were treated to what so often happens when we chew our nails and squirm and howl for the whistle because we’ve carelessly let the other side in, Duffo pots an own goal and hell they’ve scored. Then it’s all backs to the wall as balls are pumped in, headed in, lobbed in, hammered in, lofted in incessantly so that we will the referee to blow for time before a 2-0 lead is squandered. But: the crowd heading up to a respectable 17,000 and thankfully it all ended well with Heaton, Jones, Barton and Gray particularly impressive in a game that could have been won in a canter if more chances had been taken. What a shame it would have been to spoil Sean D’s third anniversary, Joe and Aunty Victoria’s special day and the incredible feelgood factor there is around the place at the moment. Memories are made of special days like this when we say what the hell, you can’t take it with you, and treat ourselves to a little bit of an extravagance.